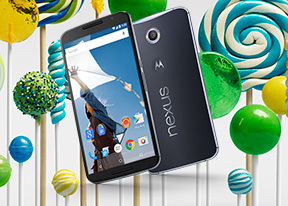 Google Photos is the default gallery app in Android 5.0 Lollipop. Upon opening the app you'll see two tabs - one for all photos and another one for highlights. Above those two tabs you will find shortcuts for settings and bulk selection. You can view photos synced to your Google cloud, or images stored only on your device. Local photos are separated depending on their source (e.g. camera or screenshots). The movie shortcuts allows you to easily select pictures and videos from which you want to create a movie and they will be automatically added to the brand new Video Creator. After that you can add music, stitching theme and your video is ready with just a few taps. Viewing a single photo gives you a number of options. You can share it, set it as wallpaper or contact photo, or edit it. The built-in Photos editor is incredibly powerful - it gives you limitless options and filters to tweak your images. Overall, Photos is an incredibly capable app to handle all your images. It is well laid-out and easy to use. The video player in the Android 5.0 Lollipop is somewhat of an afterthought - there is no dedicated app, so you will have to seek out you videos via the Photos app. Supported codecs include H.263, H.264 AVC, MPEG-4 SP, and VP8. The app will play most major file formats, though serious video fans should certainly seek out a more capable solution from the Google Play store. Google Play Music is the default player for your tunes out of the box. The app has been treated to the new material design, though it functionality remains unchanged - it can play your local files, as well as stream music from the cloud. You can tweak the sound via the built-in equalizer. There are dedicated toggles for surround sound and bass. The Now Playing screen uses the song album art and gives you a quick shortcut to the rest of the artist's songs along with the play controls. While the player is working, the entire lockscreen features the album art and track info for the current song along with dedicated playback controls. The notification area also lets you control the playback via an expandable notification. Google will give you six months of free subscription to its music streaming service. The latter is one of the most capable around and certainly worth a try. The Motorola Nexus 6 was perfect in all but one reading in the active external amplifier part of our test. The exception is its very high intermodulation distortion, which however is enough to bring the overall mark down significantly. Leave that aside and you have the loudest output and some of the best scores in the class - it's just too large a deviation to ignore though. Plugging in a pair of headphones causes the volume levels to plummet to below average levels, although the intermodulation distortion is completely eliminated in the process. The stereo crosstalk rises an average amount, but with the low loudness the performance is again hardly worth writing home about. 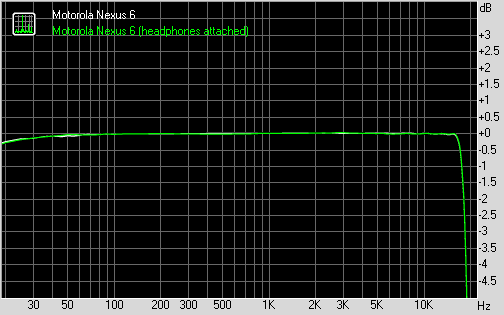 Overall the Nexus 6 audio quality is a story of wasted chances - a couple of defects ruin what could have been class leading output. As things stand now, we are looking at a device a cut below its key competitors.